JAL self-tagging kiosks at Tokyo Haneda Terminal 1. Image by Japan Airlines. Japan Airlines (JAL) plan to streamline check-in process by offering self-tagging service for its domestic passengers departing from Tokyo Haneda (HND) Terminal 1. JAL plans to roll out these self-tagging kiosks from end of March 2015. JAL new-style travel experience. Image by Japan Airlines. There will be a total of 10 kiosks available: 4 in front of check-in counter No. 54 in the North Wing and 6 in front of check-in counter No. 28 in the South Wing. To use the kiosk, you simply scan your boarding pass to issue the baggage tags, tag your checked baggages, then proceed to the baggage drop-off counter to confirm the baggage condition, weight, and destination of the baggage with the ground staff. 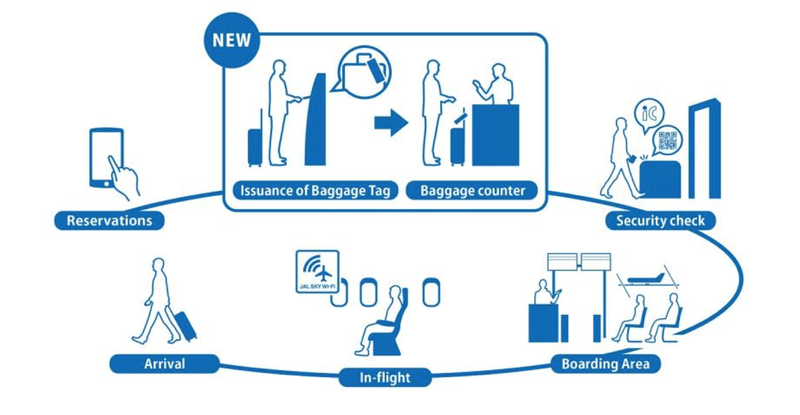 JAL expect this self-tagging service to reduce passengers' wait time for checking in baggages. Of course, for those who wants to stick with the traditional check-in experience, it will still be available.